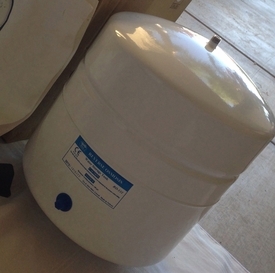 This PAE RO-132 tank is the best bladder tank on the market for residential Reverse osmosis system. It is used by many major RO manufacturers including Watts and Eden. It is made of steel with FDC approved Food grade bladder inside. It comes pre-charged with 7 psi of air pressure. When tank is full, it may reach 45 to 50 psi of pressure depending on your RO system. The water inlet is 1/4" MPT with stainless steel thread. It can be re-pressurized using an air pump through the air valve. The outside volume is 4.4 gallons, but, internally the bladder holds 3.2 gallons. A tank ball valve (not included; buy it separately) makes the connection with 1/4" tubing possible. The tank will accumulate water and provide pressure at the dispensing faucet. The bladder inside the tank will keep the purified water under pressure from the compressed air on the other side of the bladder. Dimensions: 11" dia x 15" H ; Weight: 8 lbs. Tank is pre-charged at 7 PSI. In the pressure tank, a butyl diaphragm separates the water and air chambers. These materials limit the growth of germs and prevent impurities inside the tank. Diaphragm-type design assure stable water outflow. Metal shell has greater pressure holding capacity than plastic. Metal also eliminates air pressure loss unless the bladder goes bad after long use. To provide more instant RO water, use larger tank or connect several tanks together.